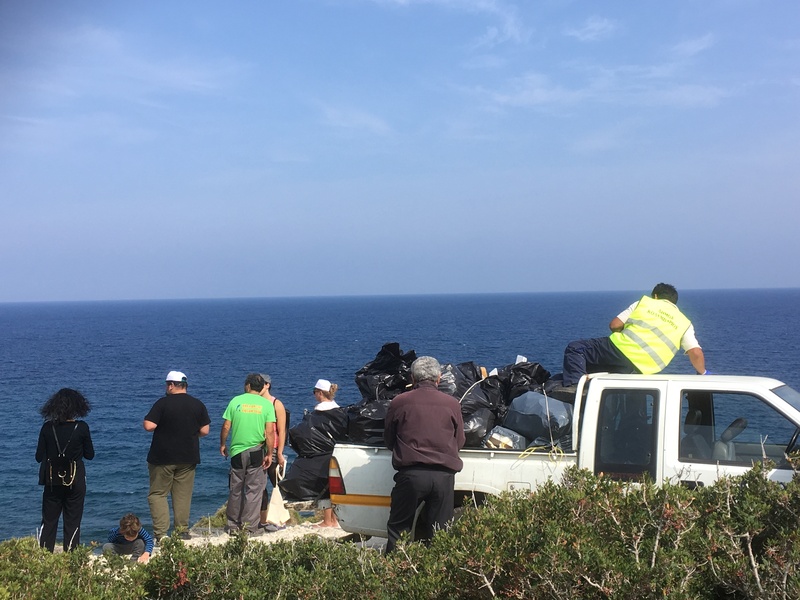 On 21st October the Kissamos Beach Cleaning Team went to a remote beach not directly accessible by car between Kolymbari and Afrata, in cooperation with Plasticfree Greece, Amaryllis from Π3=PlasticPollutionPrevention, Spiros Petrakis & family, Markos Malandrakis from the Municipality Platanias and Waste Management DEDISA. Great teamwork, a big thank you to all of you, especially to the ‘newcomers’. 25 equally minded people, output: 60 big rubbish bags – mostly plastics that will be recycled instead of ending up in our stomachs (see: http://theconversation.com/youre-eating-microplastics-in-wa…). The Municipality of Platanias provided us with plastic bags, gloves and water. In addition, they provided a pickup truck and two employees for the transportation of the bags. The pickup, however, was too small for the amount of rubbish collected. So the Mayor of Platanias arranged for the remaining bags to be picked up by a boat. After the beach clean we got together in Afrata where we enjoyed lunch. Καλή παρέα! – The complete report on the PlasticfreeGreece site. Let me add a few thoughts…. CAN BEACH CLEANS DO MORE THAN JUST CLEAN-UP RUBBISH? -Our aim is to encourage a continued commitment to that activity and to raise awareness for preventive and sustainable actions. Well, the Garbage is still on the Beach, in big PLASTIC-bags…..
Maybe someone could contact the Mayor and ask WHEN it should be picked up…….